Dinosaurs are moving into the LEGO House! Huw and I were lucky enough to visit the LEGO House in Billund last week and we published some photos of our experience a couple of days ago. We have now received more details about one of the most exciting aspects of the entire museum: the masterpiece gallery. 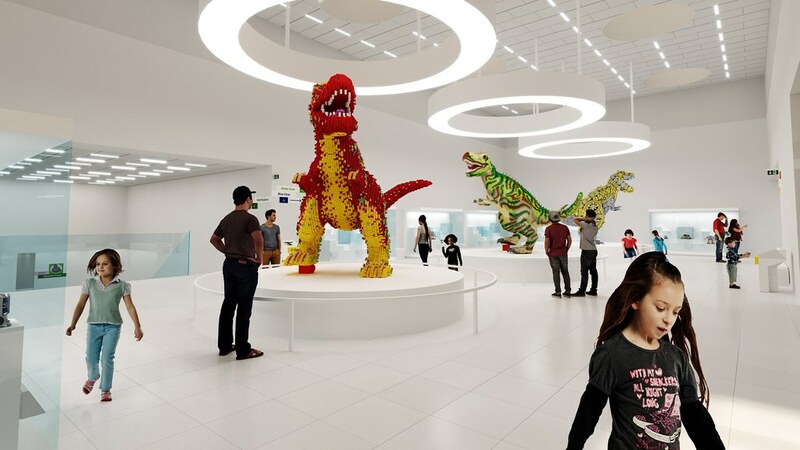 This display space will house LEGO models made and inspired by fans, at the centre of which are three enormous dinosaurs built from Duplo, System and Technic parts. 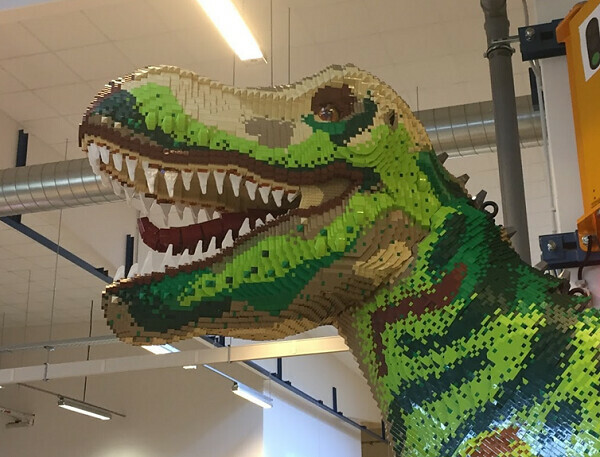 A group of 26 AFOLs were invited to assist in the design of the three dinosaurs and they have been constructed at the Kladno modelshop in readiness for transport to the LEGO House. 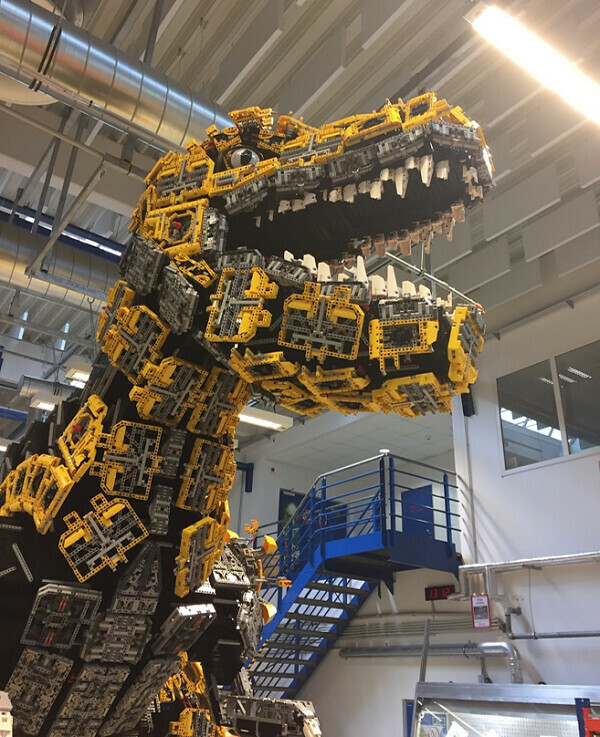 Each dinosaur will stand over three and a half metres tall when placed on its podium and are representative of the three current LEGO building systems. The Duplo dinosaur is brightly coloured to reflect the fun and vibrant nature of LEGO Duplo. 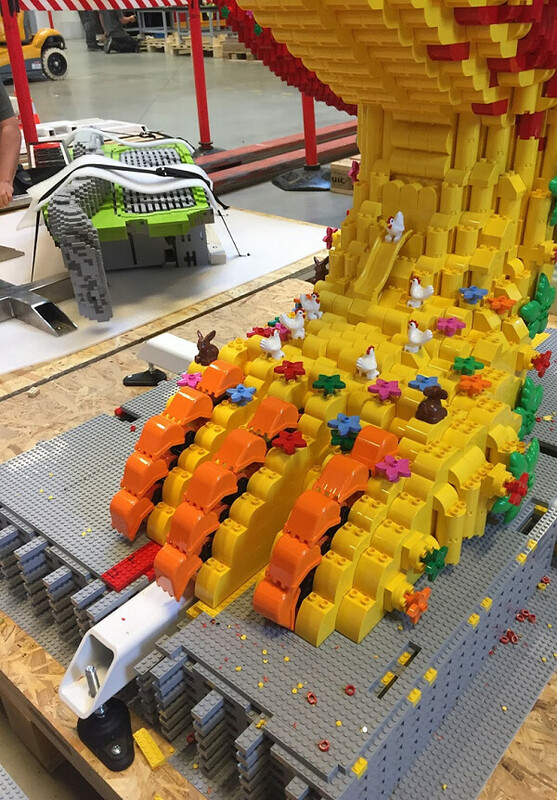 It contains 50,904 bricks, the fewest of the three, but is not lacking in detail as flowers dot the skin of the dinosaur and digger shovels form the claws. This technique was suggested by fans and shows that clever use of parts is not limited to System or Technic but can also be applied to Duplo. The System dinosaur is the most realistic of the three, with an earthy colour scheme and plenty of textured detail. This model contains 253,274 pieces and incorporates traditional building techniques, although there are still many delightful features to be discovered, including highly detailed eyes with a piercing gaze. 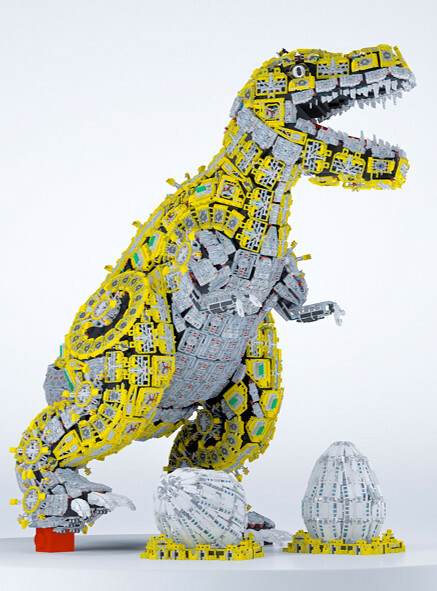 The Technic dinosaur contains the most parts, weighing in with some 298,431 elements! This presented the greatest challenge as large scale display models are rarely built using Technic, although a paneled design was finally chosen. Over 700 panels, with 18 unique designs, are required to cover the entire dinosaur! You might notice that the dinosaurs appear to be roaring, perhaps due to the red 1x1 bricks which they are treading on! It should also be noted that all three dinosaurs come with a couple of eggs which will soon hatch. In fact, some of them are already starting to crack. Tickets for the LEGO House are now available to purchase here. We will continue to update you regarding its progress as the opening date of September 28th approaches. That System dinosaur is incredibly realistic! This is Lego at it's very best. It's really amazing how these three systems can all build the same thing. I like how the dinosaurs have similar designs but all look unique. These are going to fit in very nicely into the Lego House. it had to be real pain to figure out and maintain equlibrity of the "green one" as not to fall over - or are they anchored to the floor? All three are gorgeous in their own way. The DUPLO dino is delightful, the system dino is so realistic, and the Technic dino is rad! Duplo.- A years back, Quatro had made it's appearance for -3 years child. I don't know how they will make this system go a step forward. 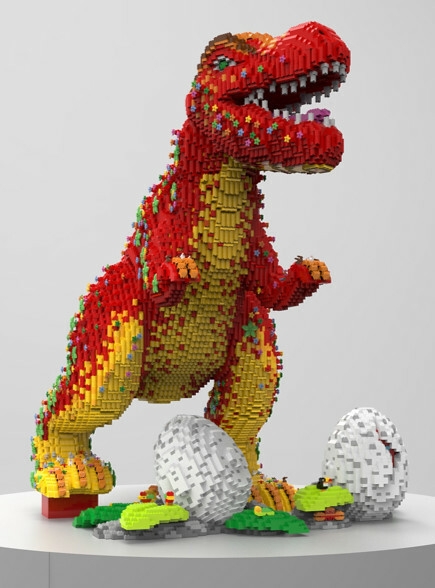 It would be nice to see a Quatro brick-built baby dino hatching from one egg. System.- Has clearly advanced to incorporate electronics and apps to enhace playability within themes such as Ultra Agents, Nexo Knights, Dimensions and Boost. Technic.- The theme has been enhanced since late 20´'s to incorporate electronic and computer-aid toys to create "linving" things as we have seen in Mindstorms theme. Also, from Technic was born the constraction and CCBS system, which are competing directly with other brand's action figures. 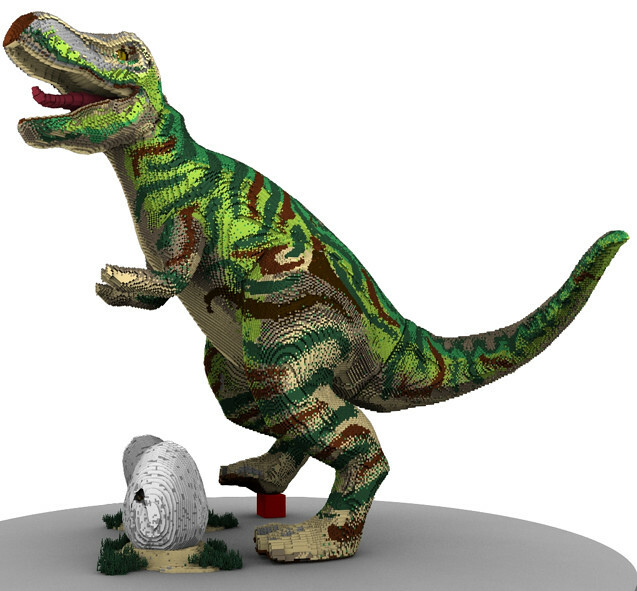 It would be nice to see a Mindstorms-built and CCBS baby dinos hatching from the Technic eggs. Beautiful creations! I can't even fathom making something of that scale. I'm incredibly impressed by these. I like actually really like the technic one; it's just so awesomely wierd! These massive scale models are fantastic - I hope there'll be loud Jurassic Park gate opening music for when people enter that floor of the house to get the full effect! It's kind of odd that the dinosaurs are stepping on red bricks - any journalist worth their salt always mentions 'that brick that hurts when you step on it'. There was actually an article in the Observer in the UK a couple of days ago which mentioned just this! They're impressive in their own right, but it will never not bother me how aggressively inaccurate they are to modern understanding of these animals. I want to add a single piece to each of these so that the piece count they tell everyone is wrong. No one else will know. But I will. This is the first time I've seen custom building using Duplo parts. Can they even do SNOT building with Duplo? I'm so out of the loop; it's been 32 years since I played with the stuff! For those asking for instructions, I think these models had metal frames within to prevent it from collapsing on itself, much like the big models found in Legoland. So it's not just a simple stacking the bricks type of build.